One of the new brands of resin vehicle kits under the umbrella of Friendship Models from the UK. Wee Friends also makes figures, accessories and diorama items. Some of these were previously released under the HQ72 label. VK4502 (P) Porsche Tiger II Prototype Full kit. Multimedia. WV72003 Canadian Ram MKI Full kit. Multimedia. WV72004 M4A1 "Michael" (1st 100 Lima produced) Full kit. Multimedia. WV72005 T6 Medium Tank (Sherman prototype) Full kit. Multimedia. WV72006 IDF M50 C. 1973 Sherman (M4A1 Hull) Full kit. Multimedia. WV72007 IDF M51 . C.1973 Sherman (M4A1 Hull) Full kit. Multimedia. M4 Composite “Late” Large hatch upper Hull Conversion set for Dragon. M4 Composite “Late” Large hatch upper Hull and transmission cover Conversion set. Reworked version of WVC7201. M4A1 (W) “Early” Large Hatch Upper Hull Conversion set for Dragon. M4A1 “Mid Production Upper Hull Conversion set for Dragon. M4(W) Sherman “Large Hatch” Upper Hull Conversion set for Trumpeter. M4A2 Sherman Mid Production “Small Hatch” Upper Hull Conversion set for Trumpeter. M4A2 (W) Sherman “Large Hatch” Upper Hull Conversion set for Trumpeter. M4A3 Sherman “Small Hatch” Upper Hull Conversion set for Dragon..
75mm Sherman “Early” Low bustle Turret Conversion set for Dragon..
75mm Sherman “Late” High Bustle Turret w/ Appliqué and Pistol Port Conversion set for ESCI. 75mm Sherman “Early-General” High Bustle Turret W/ Pistol Port Conversion set for ESCI. 75mm Sherman (Mid-Production) Low Bustle Turret W/ Appliqué Armour & Pistol Port Conversion set for Dragon..
75mm Sherman “Late” High Bustle Turret (W Pistol Port) Conversion set for ESCI. 75mm Sherman Low Bustle Reinforced Turret (W/O Pistol Port) Conversion set for Dragon..
105mm Sherman “Late” High Bustle Reinforced Turret Conversion set. 76mm Sherman “Early” (T23) Turret Conversion set, containing only the turret body. 76mm Sherman “Early” (T23) Turret Conversion set. VK4502P Tiger Prototype Turret and Hull Conversion set. Canadian Ram MKII Badger "Late"
Canadian Ram MKII Gun tank "Early" hull. Canadian Ram MKII Gun tank "Late" hull. M113 Cadillac Cage T50 Turret Conversion for Esci/Italeri. SdKfz 251/7 Ausf D Ambulance Resin. WVC72034 SdKfz 251/7 Ausf D Pioneer Resin. M4A1 Large Hatch Late Resin. Conversion for Esci/Italeri. WVC72038 17 pdr Firefly Turret Low Bustle (incl. turret fittings, gun barrels) Mixed media. WVC72044 M113 Sandbagged Floor (Viet Nam) Resin. For Esci/Italeri kits. WVC72047 75mm High Bustle Late Turret Resin. WVC72051 GMC CCKW 353 Fuel Servicing Truck Resin. WVC72053 Sd Kfz 250 Half Track interior and stowage set Resin. Sherman 3 Piece Bolted Transmission housing Resin. Sherman Cast Transmission Housing Resin. Sherman Cast Transmission Housing, Rounded Profile Resin. Sherman Cast Transmission Housing, Sharp Nose Profile Resin. WVC72073 Sherman 75mm Low Bustle turret Mixed media. For Italeri quick build kit. WVC72074 IDF M51 Degem Alef Batch O M4A1original engine deck. (Turret Only) Mixed media. WVC72077 IDF M51 Turret and Fittings Pre 1973 Batch 3 Engine Deck Mixed media. WVC72079 M4A3E2 Jumbo upper Hull Conversion Mixed media. For Italeri kit. WVC72080 M4A3E2 Jumbo turret Conversion Mixed media. For Italeri kit. WVC72081 M4A3E2 Armoured Transmission Housing Mixed media. For Italeri kit. WVC72082 76mm (T23) Early Turret Conversion Mixed media. WVC72084 M4A4 Direct Vision Hull Conversion Resin. For Dragon kit. WVC72086 M4A4 Lower Hull. Resin. For Dragon kit. WVC72087 Early M4A2 Lower hull for M4A2 or M10 Resin. WVC72088 Early rivitted Lower hull for M4-M4A1 Resin. WVC72090 M4 Mid Production Small Hatch Wargames Hull Resin. For Italeri kit. WVC72091 M4A1 Mid Production Wargames hull Resin. For Italeri kit. WVC72092 Initial rivited hull For T6 & 1st 100 Lima Buit M4A1 Resin. For Italeri kit. WVC72093 T6 Prototype (Hull and Turret) for Mirage M3 Kit Resin. WVC72094 M4A1 Michael (Very Early M4A1 Hull and Turret) For Mirage M3 Kit Resin. WVC72096 IDF M4A4(T) Sherman hull Conversion Resin. WVC72096A IDF M4A4(T) Sherman hull and turret conversion set Resin. WVC72097 Egyptian M4A4/A2 Sherman Upper Hull Resin. WVC72097A Egyptian M4A4/A2 Sherman Upper Hull and turret Resin. WVC72098 Egyptian AMX13 Turret Resin. WVC72099 M4 Small Hatch "Early" Composite Upper Hull Resin. WVC72100 M4A4 Late production Upper Hull Resin. WVC72101 M4A6 upper hull Resin. WVC72102 Canadian Ram MkI Hull and Turret Resin. For Mirage kit. WVC72103 King Tiger Porsche Turret Resin. WVC72105 M10 Lower Hull and Lower turret with basic interior set Resin. For Armourfast kit. WVC72106 M10 17Pdr Achilles Lower hull and turret interior parts Resin. For Armourfast kit. WVC72107 M36 Turret interior and M4A3 lower hull (for M36B1 Resin. For Armourfast kit. WVC72108 M4 Sherman Lower hull Resin. For Armourfast kit. WVC72109 M4A2 Sherman Lower Hull Resin. For Armourfast kit. WVC72110 M4A3 Sherman Lower Hull Resin. For Armourfast kit. WVC72111 M4A3E2 Sherman Jumbo Conversion set Mixed media. For Armourfast kit. WVC72113 M36 Turret interior and M10 Lower hull Resin. For Armourfast kit. WVC75095 75mm Low Bustle very early Initial Turret Resin. SdKfz 251/9 Ausf D Pioneer Resin. Sherman T23 Turret for M4A1, M4A2 and M4A3 Resin. WWII British Infantry Weapons Set 1. Bren LMG, Vickers HMG, Lewis LMG, Boyes Anti Tank Rifle Metal. 2 of each. 1/76 but usable in 1/72. Metal. 5 each 2pdr, 6pdr, 3”CS, 75mm. WWII Italian Weapons set No.1 Metal. Breda MG30, Carbines 1891, & 1938. 5 Each. 1/76 but usable in 1/72. Tow Ropes and Shackles Two strands of braided copper wire (11 cm) and 4 metal tow shackles, which look like generic types. WWII British Ammo Boxes Metal. 3 types. 5 each. WBM76020 Workshop Tools White metal. WBM76021 Tow A-Frames, Folded (Qty 5) White metal. WBM72032 Life Rings (life buoys) (Qty 10) White metal. WBM72034 WWII German MG Ammo Boxes (5 open, 10 closed) (Qty 15) White metal. WBM76035 Vehicle Parts Truck Brake Levers (Qty10) White metal. WBM76042 Bedford MW detailing set (incl. wheels, fuel tank and steering wheel) White metal. For Airfix kit. WBM72066 British desert Stowage Resin. WBM72067 WWII German Vehicle Stowage Resin. WBM72073 Jeep Wheels White metal. For Airfix/Heller kit. WBM72074 0.50Cal MG with Pintle Mount and Ammo Box (Qty 5) White metal. WBM76092 Tow A-Frames, Open (Qty 5) White metal. WBM76093 WWII British Infantry Weapons set 2, Lewis LMG (Qty 10) White metal. WBM76094 WWII British Infantry Weapons set 3, Bren LMG (Qty 10) White metal. 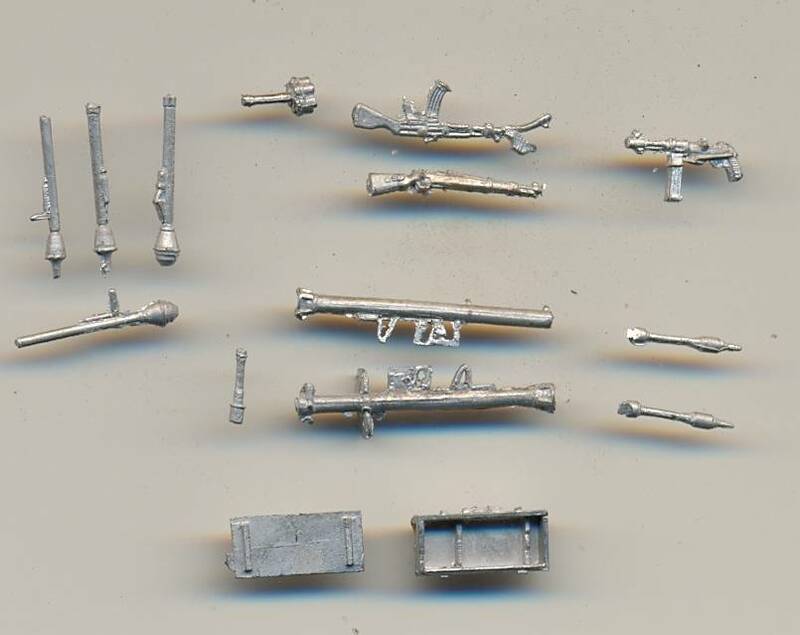 WBM76095 WWII British Infantry Weapons set 4, Vickers K LMG (Qty 10) White metal. 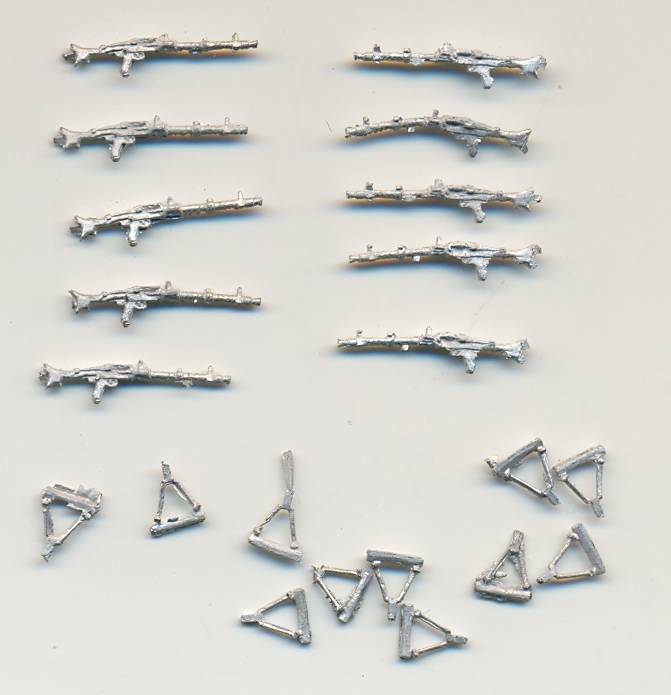 WBM76096 WWII British Infantry Weapons set 5, Vickers HMG (Qty 10) White metal. WBM76097 WWII British A15 Crusader Wheel set Resin. For Airfix kit. WBM76098 WWII British A13-A15 Cruisers Early Pattern Tracks White metal. WBM76099 WWII British Crusader MkI/II Detailing set Mixed media. 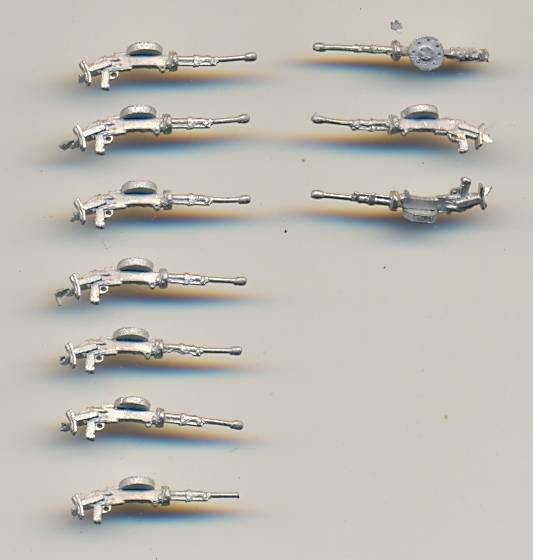 WBM76100 WWII British Vickers Slow Motion Suspension set White metal. WBM76101 WWII British A9-A10 Valentine Early Pattern Tracks White metal. WBM76102 WWII British Fire Extinguishers (Qty 10) White metal. WBM76103 WWII British Hull and Turret MG Barrels, 4 types (Qty 25) White metal. WBM76104 Head Lights (x20) (x10 headlights, x10 Side Lights) White metal. WBM76106 Vehicle Stowage Coiled wire roll + hanging chains (Qty 10 + 2 Chains) White metal. WBM76107 BIW6 Lee Enfield Rifle White metal. WBM76108 BIW7 Sten SMG White metal. WBM76109 Vehicle Cable Reels, (D10. Donten type) (Qty10) White metal. WBM76110 Stacked Loads 2, 2 x Large CratesTarpauline covered) Resin. WBM76111 Stacked Loads 3, Trap covered 55 Gal oil Drums (Large) Resin. WBM76112 Stacked Loads 4, 3 x Trap covered 55 Gal oil drums (Small) Resin. WBM76113 Stacked Loads 5, 3 x Tarp covered oil drums and crates Resin. WBM76114 Stacked Loads 6. 1 x Tarp covered oil drums, (1 x 8) Resin. WBM76115 WW2 US Pattern Jerrycans (15) White metal. WBM76116 WW2 British Pattern Jerrycans White metal. WBM76117 Vehicle Parts Flashing Lights on Pole(Qty 15) White metal. 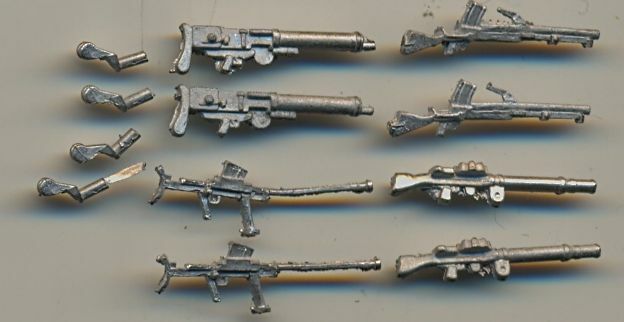 WBM76118 WW2 German Infantry Weapons.7 MP43 (Qty 10) White metal. WBM76119 WW2 G.I.W. 8 MP40 Schmeisser (Qty10) White metal. WBM72120 M4 Sherman Detail set for Heller M4 or M4A2 kits Resin. WBM72121 M4-M4A1 Sherman (Late) Rear Hull Plate (style1) Resin. WBM72122 Sherman VVSS Flattened Bogies (for M4 Firefly, M4A3E2 Jumbo etc.) White metal. WBM72123 M3 (Early Style) VVSS Track units. Resin. WBM72124 M4 VVSS Track Units Resin. WBM76125 Sherman WE201 Double I tracks. White metal. WBM72126 Sherman T48 Rubber Chevron tracks with end connectors White metal. WBM72127 BRDM 2 Wheels and detail set (Qty 4) White metal. WBM76128 USMC LAV 25 Wheels (Early pattern) (Qty 8 White metal. WBM72129 WWII USIWS 2 M3, Submachine gun.45 cal. 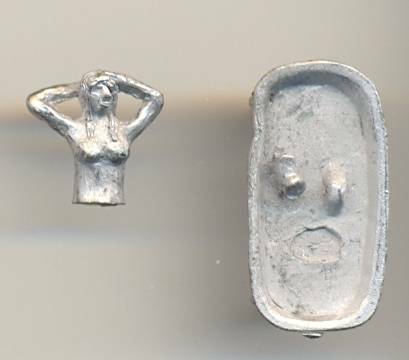 (Qty 10) White metal. WBM72130 WWII USIWS 3. M1 Garand Rifles (Qty10) White metal. WBM72131 WWII USIWS 4. M1 Carbine (Qty10) White metal. WBM72132 5 Gallon Oil Drums (Qty 10) White metal. WBM76133 Large Wooden Crates (Qty 4) Resin. WBM72134 M113 Road Wheels (Esci- for Italeri kiteri) Resin. For Italeri kit. WBM76135 Modern Water Jerrycans in Vehicle Mounts (Qty 15) 3 types. White metal. WBM72137 WW2 German AFV Jacks (Qty 10) White metal. WBM72138 Modern Pattern Jerry cans type 2 (Qty 15) White metal. WBM72139 IDF Pattern Jerrycans (Qty 15) White metal. WBM72140 MBWS 4. Blowpipe Missile Launchers (Qty 10) White metal. WBM72141 MBWS 5. L1A1 7.62 SLR (Self Loading Rifle) (Qty10) White metal. WBM72142 105mm British L118 Light Gun Ammo. (x10 Rounds, x10 Shells) White metal. WBM72143 British All Round Vision Cupola (Qty 2) Resin. WBM72144 M3 VVSS Suspension units for Heller (Qty 6 sets) Resin. WBM72145 0.50Cal MG with Pin Mount (for cupola's etc.) and Ammo Box (Qty 5) White metal. WBM72146 MAWS 4. M240 Vehicle mounts (Qty 5) White metal. WBM72147 M3 Early VVSS complete track units Resin. For Italeri kit. WBM72148 M4 Late VVSS complete track units Resin. For Italeri kit. WBM72149 M4 HVSS complete track units Resin. WBM72150 Modern Vehicle Fire Extinguishers (Qty 10) White metal. WBM72151 GPMG (with folded bipods being carried) (x10) White metal. 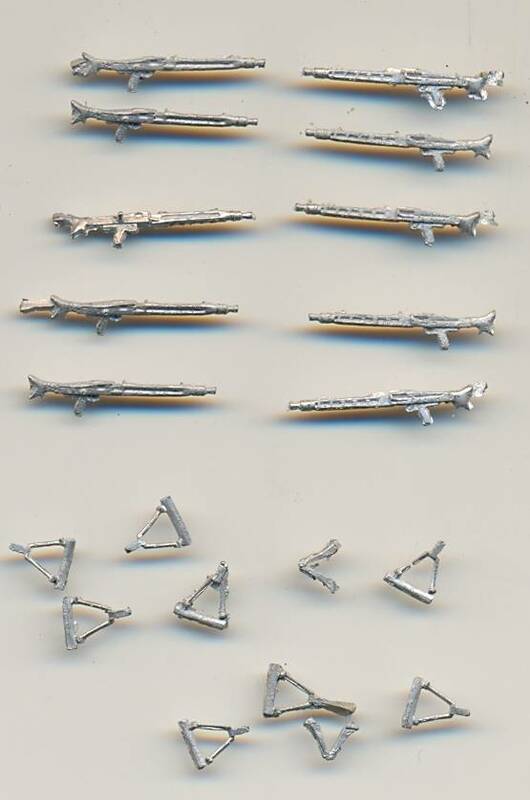 WBM72152 WWII German Infantry Weapons Set 9, Fallschirmjägergewehr 42 White metal. 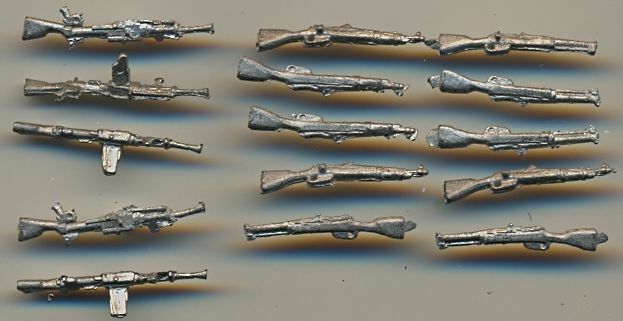 WBM72153 WWII German Infantry Weapons Set 10, Stick Grenades (15) White metal. WBM72154 Bicycles (x 2) White metal. WBM72155 Vehicle Stowage Assorted Tarpaulins (x 30) Resin. WBM72156 Vehicle Stowage Assorted Camo Nets (x 30) Resin. WBM72157 IDF Sherman Stowage set Resin. WBM72158 Small Store Container Resin. WBM72159 Vehicle Stowage Assorted Items (x 30 ) Resin. WBM76164 30mm Rarden ( Scimitar, Warrior, Fox) gun barrels (Qty 10) White metal. WBM76165 76mm (Scorpion) gun barrels (Qty 10) White metal. WBM76166 A-Frame Folded (Small) (Qty 5) White metal. WBM76167 Tow Bar (Straight Pull) (Qty10) White metal. WBM76168 AT105 Saxon Wheels, Springs, Axles, Drive Shafts, Gear Box Mixed media. 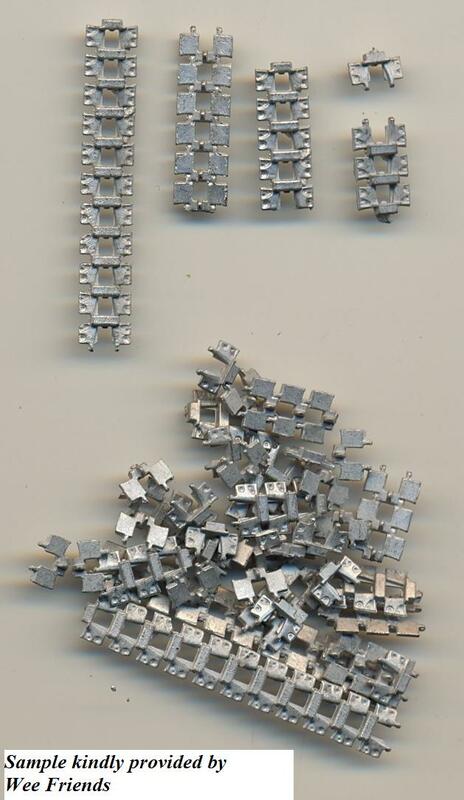 WBM76169 Antenna Bases (6 x TUAM, 12 x Clansman Bases, 6 x Wip Antenna Bases) White metal. Sd Kfz 8 Famo Combo set For Revell. Includes 72013, & 72009 and 72022. Jeep Engine Grill Cast metal. For Airfix/Heller kits. Char 1Bis Drivers Periscope Cover Cast metal. For Trumpeter kit. 0.30cal ammo boxes (x15) Metal. 15 assorted small resin boxes Resin. WWII US Army Infantry Small Arms(Generic) Metal. Modern M16 / M4 Assault Rifle variants Metal. Modern IDF Tavor Rifle Variants Metal. 0.50 Cal Ammo Boxes X2 strapped to tray (Typical IDF) Metal. 1 M2 0.50 Cal Browning with ground mount and ammo box. Modern military bergen's (3xlarge,2 x small). Modern American Weapons set 1, M16A2 Rifle (10 pcs) White metal. 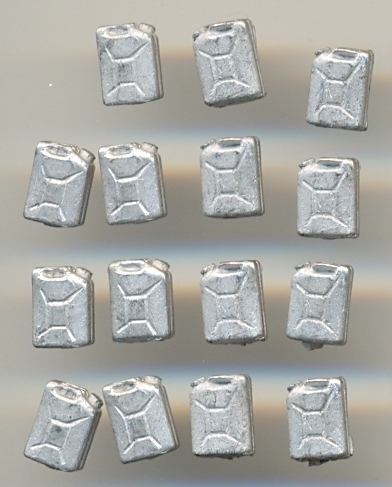 Modern American Weapons set 2, M240 MG on Vehicle pintle mount (10 pcs) White metal. Modern American Weapons set 3, M60E3 with Bipods MG (10 pcs) White metal. Modern British Weapon set 1 GPMG with Bipods (10 pcs) White metal. Modern British Weapon set 2 SA 80 Rifle (10 pcs) White metal. Jerrycan in Vehicle mounts (15 pcs) White metal. WFR72001 WWII Soviet tank crew Resin. Three man tank crew in cold weather uniforms. The set comprises a full commander figure,3/4 torso loader figure, and a head and shoulder driver figure. Sculpted by T-Izumi. WFM72002 WWII German Land Wasser Schlepper Crew (2 Figures) Metal. WFM72003 WWII Axis Sahariana Crew with alternative German and Italian heads Metal. WFM72004 WWII British Expeditionary Force Tank Crew France 1940 (5 Figures) Metal and a little bit of resin. WFM72005 WWII German Fallschrimjäger set no 1 1944 (5 Figures) Metal and a little bit of resin. WFM72006 1942 Luftwaffe North Africa set (5 Figures) Metal. WFM72007 WWII German Fallschrimjäger set no.2 1944 (5 Figures) Metal. WFM72008 Modern Soviet Vehicle Crew (1 Half, 1 Full Figure) Metal. 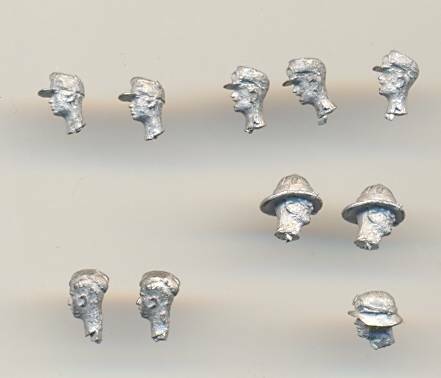 WFM72009 WWII German Half Track Crew in Summer dress (5 Figures) Metal. WFM72010 Modern IDF Infantry Squad (5 Figures) Resin. WFM72011 WWII Deutsches Afrika Korps Refuelling Set (5 Figures and Accessories) Metal and resin. WFM72012 Civilian Female Barmaid Oktober Fest Metal. WFM72013 WWII Female Royal Air Force Driver. Samantha Metal. WFM72014 WWII Soviet Female Tank Commander Metal. WFM72015 WWII Italian Tank Crew Metal. WFM72016 WWII Soviet Female Army Nurse Metal. WFM72017 Civilian Woman and children Metal. WFM72018 Civilian Old Women Metal. WFM72019 Modern IDF Infantry Squad, Tavor Rifle,Medic, Radio Op, Officer. Metal. WFM72020 Modern IDF Female Soldier with M4 Assault Rifle Metal. WFM72021 Late War German Tank Crew Metal. WFM72022 Late War German Infantry With IR Equipment, and Backpacks Metal. WFM72023 Modern US Army UAV Set Metal. WFM72024 Zombie Huntress Tanja Metal. WFM72026 Female Street Gangster Metal. WFM72028 Modern US ARMY EOD Set with Packbot Metal. WFM72029 WWII US Army Truck Drivers. Metal. WFM72030 Modern US Army Helicopter Crew Metal. WFM72031 WWII German Luftwaffe Flak 88 Crew Metal. WFM72032 WWII Japanese Tank Crew Metal. WFM72033 WWII Russian Tank Crew Reloading Metal. WFM72034 WWII US Tank Crew	 Metal. WFM72035 WWII Russian Anti Tank Dogs with Handlers Metal. WFM72036 WWII SAS Jeep Set No.1 Metal. WFM72037 WWII SAS Jeep Set No.2 Metal. WFM72038 WWII SAS Dismounted Patrol set Metal. WFM72039 British Infantry Patrol. Platoon leader, radio man, LMG, 4 x armed with SA80 Metal. WFM72040 Royal Marines searching for Al Qaeda. (5 figures) All carrying Bergens armed with LMG, LAWs, Milan and SA80. (Ex CMSC DF12) Metal. WFM72041 Royal Marines without Bergens. 5 figures with optional heads (berets/helmets) armed with LSW, LAWs, Milan and SA80. (Ex CMSC DF14) Metal. WFM72042 British Infantry de-bussing from Warrior and taking defensive positions.5 figures: prone (SA80), kneeling SA80), in vehicle doorway (SA80) and 2 running( 1 SA80, 1 LSW). (Ex CMSC DF16) Metal. WFM72043 British Infantry in the Gulf. 5 figures: prone firing (LMG), standing firing (SA80), kneeling (SA80),advancing (LSW) and pointing (SA80). (Ex CMSC DF17) Metal. WFM72044 British Infantry in the Gulf. 5 figures: prone with binoculars, standing (SA80),kneeling (LAW), kneeling (Radio) and running (SA80). (Ex CMSC DF18) Metal. WFM72045 US Infantry peacekeepers wearing belt equipment with terrorist suspect 5 figures: kneeling (M249); 2 standing (M16); standing (M4) with foot on back of prone suspect. (E CMSC DF20) Metal. WFM72046 Modern US AF Crew. 5 figures. Commanders, Loaders, Driver, cut off at chest level. (Ex CMS DF19) Metal. WFM72047 Modern US AFV Crew. 5 figures. As set WF7446 but cut off at hip level. (Ex CMSC DF-21) Metal. WFM72048 Insurgents wearing Western dress. 4 figures: 1x AK-47 running, 1x AK-47 Dancing, 1 standing aiming RPG-7, 1 laying injured or dead. (Ex CMSC DF27) Metal. WFM72049 USMC LAV 25 Crew Metal. WFM72050 US Infantry Debussing APC (Ex DF 22) Metal. WFM72051 Modern British Royal Artillery 105mm Light Gun Crew plus ammo rounds (DF1) Metal. WFM76052 British Truck Drivers (No Legs) choice of heads with Berets or Helmets (DF04) Metal. WFM76053 British AFV Crew (2 each Cmdr, Gunner, Driver) 4 choice's of head gear. Metal. WFM72054 British AFV Crew, Warrior, Challenger, (Revell) six half figures. Metal. WFM72055 Modern British Landrover/WMIK crew Metal. WFM72056 Modern British Maintenance set 1 Metal. WFM72057 Modern British Maintenance Set 2 (AFV's) Metal. WFM72058 Modern US Infantry Hummer Crew Metal. WFM76059 Modern French AFV Crew Metal. WHM76005 Modern British Infantry Heads with Helmets. WHM76010 British Heads with Berets.